I’ve managed to make my brother’s Roland PC-300 controller keyboard work with my MacBook and I’ve just started using Garageband. Let me tell you that it is a fantastic piece of software. 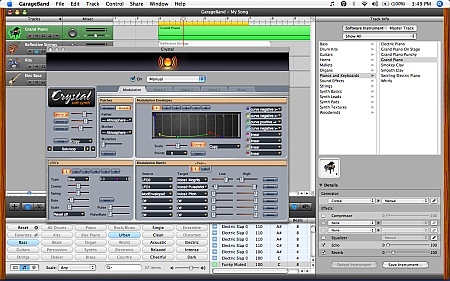 It’s easy to use and, for me, as feature-packed as Logic Audio (which I was using previously on my PC). Garageband comes with a fantastic set of Apple Loops which make music creation really painless. Garageband offers a lot of virtual instruments and is also compatible with third-party Audio Units like the rather excellent Crystal that you can see in the picture above. I’ll post some tracks hopefully by the end of the week. Hmm, I’ve checked out Garageband and it’s a really nice piece of software. As I’m using using Windows, I can’t use it. But I’m trying hard to use Fruity Loops. What is really impressive in Garageband is how easy it is to use. The user interface is really a marvel in design. And it is as powerful as its bigger brother Logic Audio for amateur musicians like myself. I’ve only just scratched the surface. I haven’t yet launched (it’s true) iMovie HD, iDVD and iWeb… I have so many things to discover. Another excellent free audiounit softsynth you might want to check is Alphakanal’s Automat 0.4.2 (Universal). It’s free for 10 days only. The quality is superb!! Both are very well written. It’s a good introduction to mastering audio, with a very hands-on approach. I learned a lot from them. I’ve also downloded T-Racks 24 which works for 10 days also. I’ll need to be really quick. By the way, I believe I already have the best book in mastering.